The 1st Marine Division is a Marine infantry division of the United States Marine Corps headquartered at Marine Corps Base Camp Pendleton, California. It is a subordinate unit of the I Marine Expeditionary Force (I MEF). It is the oldest and largest active duty division in the United States Marine Corps, representing a combat-ready force of more than 19,000 men and women. It is one of three active duty divisions in the Marine Corps today and is a multi-role, expeditionary ground combat force. It is nicknamed "The Old Breed". The division is employed as the ground combat element (GCE) of the I Marine Expeditionary Force or may provide task-organized forces for assault operations and such operations as may be directed. The 1st Marine Division must be able to provide the ground amphibious forcible entry capability to the naval expeditionary force (NEF) and to conduct subsequent land operations in any operational environment. The division's regiments were in existence as early as 8 March 1911, when the 1st Marine Regiment was formed at Guantanamo Bay, Cuba. The 5th Marines were created in Vera Cruz, Mexico on 13 July 1914 and participated in 15 major engagements during World War I, including Belleau Wood, Chateau Thierry, and St. Mihiel. On 7 August 1917, 7th Marines were activated in Philadelphia, Pennsylvania and spent the duration of World War I in Cuba and were disbanded after the war. The 11th Marines was formed in January 1918 at Quantico, Va., as a light artillery regiment. The regiment went to France as an infantry unit, providing a machine gun company and a guard company. Decommissioned and reactivated twice between the world wars, the regiment was re-formed in 1940 as a full-fledged artillery unit. 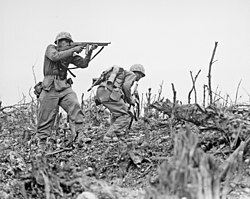 Marines of 1st Marine Division fighting on Okinawa, 1945. The 1st Marine Division was activated aboard the USS Texas on 1 February 1941. The division's units were scattered over the Pacific with the support elements and the 1st Marine Regiment transported en route to New Zealand on three ships, the USATs Ericsson, Barnett and Elliott from Naval Reserve Air Base Oakland to New Zealand, and later were landed on the island of Guadalcanal, part of the Solomon Islands, on 7 August 1942. Initially only the 7th Marine Regiment was in garrison on British Samoa, with the 5th Marine Regiment having just encamped at Wellington, New Zealand after disembarking from USAT Wakefield, and the 1st Marine Regiment not scheduled to arrive in New Zealand until 11 July. The 1st Raider Battalion was on New Caledonia, and the 3rd Defense Battalion was in Pearl Harbor. All of the division's units, with the 11th Marines (artillery) and 75mm howitzer armed 10th Marines battalion would rendezvous at Fiji. Due to the change in orders and shortage of attack and combat cargo vessels, all of the division's 2.5 ton trucks, M1918 155-mm howitzers and the sound and flash-ranging equipment needed for counter-battery fire had to be left in Wellington. Also, because the Wellington dock workers were on strike at the time, the Marines had to do all the load reconfiguration from administrative to combat configuration. After 11 days of logistical challenges, the division, with 16,000 Marines, departed Wellington in eighty-nine ships embarked for the Solomon Islands with a 60-day combat load which did not include tents, spare clothing or bed rolls, office equipment, unit muster rolls or pay clerks. Other things not yet available to this first wave of Marine deployments were insect repellent and mosquito netting. Attached to the division was the 1st Parachute Battalion which along with the rest of the division conducted landing rehearsals from the 28th to the 30 July on Koro Island which Major General Alexander Vandegrift described as a "disaster". On 31 July the entire Marine task force was placed under the command of Vice Admiral Frank J. Fletcher's Task Force 61. The division as a whole would fight in the Battle of Guadalcanal until relieved at 1400 on 9 December 1942 by Alexander Patch's Americal Division. This operation won the Division its first of three World War II Presidential Unit Citations (PUC). The battle would cost the division 650 killed in action, 1,278 wounded in action with a further 8,580 contracting malaria and 31 missing in action. Others were awarded for the battles of Peleliu and Okinawa. Following the Battle of Guadalcanal, the division's Marines were sent to Melbourne, Australia for rest and refit. It was during this time that the division took the traditional Australian folk song "Waltzing Matilda" as its battle hymn. To this day, 1st Division Marines still ship out to this song being played. The division would next see action during Operation Cartwheel which was the codename for the campaigns in Eastern New Guinea and New Britain. They came ashore at the Battle of Cape Gloucester on 26 December 1943 and fought on New Britain until February 1944 at such places as Suicide Creek and Ajar Ridge. During the course of the battle the division had 310 killed and 1,083 wounded. Following the battle they were sent to Pavuvu in the Russell Islands for rest and refitting. The next battle for the 1st Marine Division would be the bloodiest yet at the Battle of Peleliu. They landed on 15 September 1944 as part of the III Amphibious Corps assault on the island. The division's commanding general, Major General William H. Rupertus had predicted the fighting would be, "...tough but short. It'll be over in three or four days – a fight like Tarawa. Rough but fast. Then we can go back to a rest area." Making a mockery of the prediction, the first week of the battle alone cost the division 3,946 casualties, during which time they secured the key airfield sites. The division fought on Peleliu for one month before being relieved. Some of the heaviest fighting of the entire war took place in places such as Bloody Nose Ridge and the central ridges of the island that made up the Umurbrogol Pocket. The month of fighting against the 14th Division (Imperial Japanese Army) on Peleliu cost the 1st Marine Division 1,252 dead and 5,274 wounded. The final campaign the division would take part in during World War II would be the Battle of Okinawa. The strategic importance of Okinawa was that it provided a fleet anchorage, troop staging areas, and airfields in close proximity to Japan. The division landed on 1 April 1945 as part of the III Amphibious Corps. Its initial mission was, fighting alongside the 6th Marine Division, to clear the northern half of the island – that they were able to do expeditiously. The Army's XXIV Corps met much stiffer resistance in the south, and in late April the Marine division was moved south where it relieved the Army's 27th Infantry Division. The division was in heavy fighting on Okinawa until 21 June 1945, when the island was declared secure. The 1st Marine Division slugged it out with the Japanese 32nd Army at such places as Dakeshi Ridge, Wana Ridge, "Sugarloaf Hill" and Shuri Castle. Fighting on Okinawa cost the division 1,655 killed in action. Following the surrender of Japan, the division was sent to Northern China as the lead combat element of the III Amphibious Corps with the primary mission of repatriating more than 650,000 Japanese soldiers and civilians still resident in that part of China. They landed at Taku on 30 September 1945 and would be based in Hopeh Province in the cities of Tientsin and Peiping, and also on the Shandong Peninsula, with the Chinese Civil War between the Kuomintang and Chinese Communist Party raging around them. Most Marines in the division would be charged with guarding supply trains, bridges and depots to keep food and coal moving into the cities. During this time they increasingly fought skirmishes with soldiers from the People's Liberation Army who saw the railways and other infrastructure as attractive targets to ambush, raid, and harass. By the summer of 1946 the division was suffering the effects of demobilization and its combat efficiency had dropped below wartime standards; however, its commitments in China remained. As it became increasingly apparent that a complete collapse of truce negotiations among the Chinese factions was apparent, plans were laid for the withdrawal of all Marine units from Hopeh. The last elements of the division finally left China on 1 September 1947. Following the end of World War II and the postwar draw down of forces, by 1950 the division only possessed the strength of a reinforced regimental combat team. The division would be assembled on the battle field and would participate in the amphibious assault at Inchon under the orders of General MacArthur. "The Old Breed" was the unit chosen to lead the Inchon landing on 15 September 1950. At Inchon, the division faced one of its most daunting challenges, deploying so hurriedly it still lacked its third infantry regiment and ordered to execute an amphibious assault in a city the size of Omaha, Nebraska under the worst tidal conditions they had ever faced. After the landing they moved north and after heavy fighting in Seoul they liberated the city. After the liberation of Seoul, the division was put back on ships and taken to the eastern side of the Korean peninsula and put ashore at Wonsan. As part of X Corps commanded by Army Major General Edward Almond the division was ordered to push north towards the Yalu River as fast as possible. The then commanding officer of the division, Major General O.P. Smith, did not agree with his superiors and had become convinced that they were stretched thin and that the Chinese Forces had entered the war. He purposely slowed his advance and consolidated along the way at every opportunity. The 1st Marine Division was attacked by ten Chinese infantry divisions on 27 November 1950. They fought their way out of the Chosin Reservoir against seven Communist Chinese divisions suffering over 900 killed and missing, over 3,500 wounded and more than 6,500 non-battle casualties mostly from frostbite during the battle. The greater part of the Chinese 9th Army was rendered ineffective as they suffered an estimated 37,500 casualties trying to stop the Marines' march out of the "Frozen Chosin". Beginning in early 1951 the division participated in several UN (UN) offensives in east-central Korea. This was followed by defending against the Chinese spring offensive composed of over 500,000 troops. By June 1951 the 1st Marine Division had pushed northward and secured the terrain around the Punchbowl and then settled into a defensive line 11 miles long. In mid-March 1952 the 8th Army, to whom the Marines were attached, instituted Operation Mixmaster. The operation was a massive redeployment of UN forces designed to put more South Korean Army units on the Main Line of Resistance (MLR). The 1st Marine Division was reassigned to the far western end of the United Nations line defending a 35-mile line that encompassed the Pyongyang to Seoul corridor. For much of the next year, in what would be termed the "Outpost War", action along this line consisted of small, localized actions because much of the fighting revolved around the holding and retaking of various combat outposts along key pieces of terrain. This changed in March 1953 when the Chinese launched a massive offensive across the U.N. line. The heavy fighting continued until the Armistice took effect on 27 July 1953. During the Korean War the division suffered combat casualties of 4,004 dead and 25,864 wounded. In 1965, the 7th Marine Regiment participated in Operations Starlite and Piranha, the first major engagements for American ground troops in South Vietnam. March 1966 saw 1st Marine Division Headquarters established at Chu Lai. By June, the entire Division was in South Vietnam, its zone of operation—the southern two provinces of I Corps—Quang Tin and Quang Ngai. Between March and October 1966 to May 1967, the division conducted 44 named operations. During the 1968 Tet Offensive, the division was involved in fierce fighting with both Viet Cong and North Vietnamese Army elements. It was successful in beating back enemy assaults in its operation areas. The division received its 7th Presidential Unit Citation for service from 29 March 1966 to 15 September 1967. and an 8th one for the period 16 September 1967 to 31 October 1968. After six hard years of combat, the 1st Marine Division returned home to Camp Pendleton in 1971. In 1975, the division supported the evacuation of Saigon by providing food and temporary shelter at Camp Pendleton for Vietnamese refugees as they arrived in the United States. In 1990, the 1st Marine Division formed the nucleus of the massive force sent to the Middle East in response to Iraq's invasion of Kuwait. During Operation Desert Shield, the division supported I Marine Expeditionary Force (I MEF) in the defense of Saudi Arabia from the Iraqi threat. In 1991, the division went on the offensive with the rest of Coalition Forces in Operation Desert Storm. In 100 hours of ground offensive combat, the 1st Marine Division helped to liberate Kuwait, defeating the Iraqi Army in the process. Immediately following the Persian Gulf War, the Division sent units to assist in relief efforts following a typhoon in Bangladesh (Operation Sea Angel) and the eruption of volcano Mount Pinatubo in the Philippines (Operation Fiery Vigil). In December 1992, Operation Restore Hope, bringing relief to famine-stricken Somalia, kicked off with the early morning amphibious landing of Marines from the 15th Marine Expeditionary Unit, which was supported by 2nd Battalion, 9th Marines. More than 15,000 metric tons of food was successfully distributed from 398 different food sites in the city during the operation. The final phase of the operation involved the transition from a U.S. peacemaking force to a United Nations peacekeeping force. U.S. Marine involvement in Operation Restore Hope officially ended on 27 April 1993, when the humanitarian relief sector of Mogadishu was handed over to Pakistani Armed Forces. The 1st Marine Division, then under the command of Major General James Mattis, was one of the two major U.S. land forces that participated in the 2003 invasion of Iraq as the land component of the 1st Marine Expeditionary Force. In December 2002, MajGen Mattis was quoted as saying, "The President, the National Command Authority and the American people need speed. The sooner we get it over with the better. Our overriding principle will be speed, speed, speed." Initially, the division fought through the Rumaila oil fields, feinted an attack towards Basrah then moved north on Iraq Highway 1 to An Nasariyah – a moderate-sized, Shi'ite dominated city with important strategic significance as a major road junction and proximity to nearby Talil Airfield. The division then fought its way to Baghdad and pushed further to secure Tikrit by forming Task Force Tripoli after the fall of Baghdad. The division covered 808 kilometers in 17 days of sustained combat, the deepest penetrating ground operation in Marine Corps history. After the invasion the division settled in to conduct security and stabilization operations in Baghdad, Tikrit, and then in south-central Iraq from May to October 2003. For actions during the war as part of I MEF the division was awarded its 9th Presidential Unit Citation. The division returned to Iraq in February 2004 and took control of the Al Anbar province in western Iraq; it was the lead unit in Operation Vigilant Resolve and Operation Phantom Fury in 2004. During February and March 2005, the division was relieved by the 2nd Marine Division concluding the largest relief in place in the history of the Marine Corps. In 2006, the division again deployed to Iraq as the ground combat element for I MEF in the Al Anbar province. It returned to MCB Camp Pendleton in early 2007. Battalions from the 1st Marine Division have been regularly deployed to Afghanistan since 2008. The division headquarters and staff were sent forward in March 2010 to take command of all Marine forces in the Helmand Province operating in support of Operation Enduring Freedom. This will be a year-long deployment for the division. Originally termed a battle blaze, the shoulder sleeve insignia of the 1st Marine Division was designed by Lt. Col Merrill Twining, Division D-3 in February 1943 while the division was stationed in Victoria, Australia. The blue diamond with the Southern Cross is similar to the Flag of Victoria. The red numeral one in the middle denotes the division's first action on Guadalcanal. A commercial firm in Melbourne first produced the shoulder patch with every Marine issued two of them that was sewn on his battle jacket. The 2nd Marine Division originally had a similar battle blaze of the same design with a red snake in the shape of a "2" also reading GUADALCANAL. Marine Corps shoulder sleeve insignia were officially authorised on 15 March 1943. Some in the division who served on Guadalcanal wore their "battle blaze" on the right shoulder to distinguish themselves from replacements who hadn't been on "The Canal". Navy Occupation Service Streamer with "ASIA"
↑ 1.00 1.01 1.02 1.03 1.04 1.05 1.06 1.07 1.08 1.09 1.10 1.11 "History of the 1st Marine Division". United States Marine Corps. Archived from the original on 15 September 2007. http://web.archive.org/web/20070915125808/http://www.i-mef.usmc.mil/DIV/generalinformation.asp. Retrieved 21 November 2007. . Accessed 9 June 2009. Archived 10 June 2009. ↑ "Roger Clarke’s Waltzing Matilda Home-Page". Xamax Consultancy Pty Ltd. Archived from the original on 11 December 2006. http://web.archive.org/web/20061211045316/http://www.anu.edu.au/people/Roger.Clarke/WM/. Retrieved 3 December 2006. ↑ Shaw, Henry I.; Kane, Douglas T. (1963). "History of U.S. Marine Corps Operations in World War II". Volume II: Isolation of Rabaul. Headquarters Marine Corps. http://ibiblio.net/hyperwar/USMC/II/USMC-II-D.html. Retrieved 6 May 2008. ↑ 22.0 22.1 Frank, Benis; Henry I. Saw, Jr. (1968). "Volume V: Victory and Occupation". History of U.S. Marine Corps Operations in World War II. Historical Branch, G-3 Division, Headquarters, U.S. Marine Corps. http://ftp.ibiblio.org/hyperwar/USMC/V/USMC-V-V-5.html. Retrieved 26 April 2009. ↑ 30.0 30.1 30.2 "Brief History of the Marine Corps in the Korean War". United States of America – Korean War Commemoration. Marine Corps History and Museums Division. http://korea50.army.mil/history/factsheets/marine.shtml. Retrieved 22 April 2009. 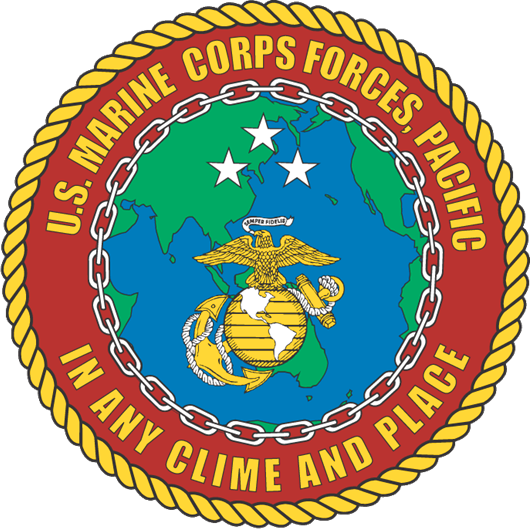 ↑ "Presidential Unit Citation Awarded the 1st Marine Division (Reinforced), Fleet Marine Force, Pacific". http://www.presidency.ucsb.edu/ws/?pid=29161. Retrieved 30 March 2009. ↑ "Remarks on Presenting the Presidential Unit Citation to the First Marines (Reinforced)". http://www.presidency.ucsb.edu/ws/index.php?pid=2250. Retrieved 30 March 2009. ↑  (2008). "AFTER ACTION REPORT~ 17 April ~ 7 May 1975". http://www.fallofsaigon.org/. Retrieved 14 March 2008. ↑ Reynolds Basrah, Baghdad and Beyond, p. 170. ↑ "Lineage and Honors of the 1st Marine Division". http://www.tecom.usmc.mil/HD/PDF_Files/Lineage%20and%20Honors/1st%20Marine%20Division.pdf. Retrieved 5 January 2012. Ballenger, Lee (2000). The Outpost War: U.S. Marines in Korea, Vol. 1: 1952. Washington, D.C.: Potomac Books. ISBN 1-57488-373-9. Chapin, John C. (2000). Fire Brigade: U.S. Marines in the Pusan Perimeter. Washington, D.C.: Marine Corps Historical Center. Cronin, Francis D. (Capt) (1951). Under the Southern Cross: The Saga of the Americal Division. Washington, D.C.: Combat Forces Press. Fehrenbach, T.R. (1963). This Kind of War. Dulles, Virginia: Brassey's Inc. ISBN 1-57488-334-8. Halberstam, David (2007). The Coldest Winter: America and the Korean War. New York: Hyperion. ISBN 978-1-4013-0052-4. Hastings, Max (2007). Retribution: The Battle for Japan, 1944–45. New York: Alfred A. Knopf. ISBN 978-0-307-26351-3. Lane, Kerry (2004). Guadalcanal Marine. Jackson: University Press of Mississippi. ISBN 1-57806-664-6. Leckie, Robert (2001). Helmet for my Pillow. Simon & Schuster Inc.. ISBN 0-7434-1307-5. Simmons, Edwin H. (2003). The United States Marines: A History, Fourth Edition. Annapolis, Maryland: Naval Institute Press. ISBN 1-59114-790-5. Sloan, Bill (2005). Brotherhood of Heroes: The Marines at Peleliu, 1944: The Bloodiest Battle of the Pacific War. Simon & Schuster. ISBN 0-7432-6009-0. Turner, David (1997). First Marine Division. Paducah, Kentucky: Turner Publishing Company. ISBN 1-56311-244-2. Warren, James A. (2005). American Spartans: The U.S. Marines: A Combat History from Iwo Jima to Iraq. New York: Pocket Books. Johnstone, Major John H., USMC (1968). "Brief History of the 1st Marines". Historical Branch, United States Marine Corps. Archived from the original on 18 June 2006. http://web.archive.org/web/20060618022931/http://www.au.af.mil/au/awc/awcgate/usmchist/1967.txt. Retrieved 4 July 2006. Wikimedia Commons has media related to 1st Marine Division (United States).